IDD Process & Packaging is excited to showcase its HEBS brewing system at the Craft Brewers Conference & BrewExpo America. Be sure to scroll down to the in-depth video at the end of the post. 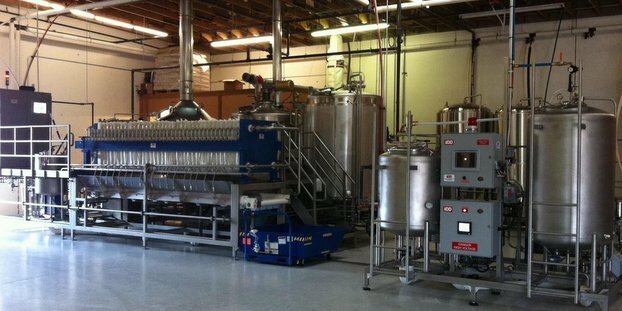 In addition to IDD Process & Packaging’s ongoing keg and flash pasteurization systems business, its main focus has shifted to its HEBS brewery that is innovating craft brewing versatility, efficiency and sustainability. According to Jeff Gunn, president and chief executive officer, IDD’s 20 Hl (17 bbl) HEBS is able to provide maximum efficiency and low environmental impact with an output of up to 60,000 Hl (50,000 bbl) per year. “This size system has by far proven to be the most popular out of the four sizes developed (10, 20, 30 and 40 Hl) because it can be almost doubled in output to achieve up to 100,000 bbl per year by ‘mirror’ imaging the brewhouse equipment to the other side of the mash filter,” Gunn said. 12. Work a normal eight hour day and complete three to four brews without being a slave to your passion. 13. Up to 10 percent better hop utilization. 14. Double the output by adding another set of brewhouse tanks and work platform to the mash filter. Stop by IDD’s booth, No. 707, where the company will be showing the HEBS, its small keg systems and mobile CIP systems. And whether you are going or not, be sure to check out this awesome three minute video covering all things HEBS. IDD Process & Packaging – HEBS from Mike Gan on Vimeo.